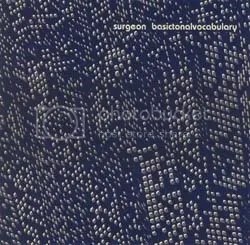 Named after the method used to contact aliens in Close Encounters of the Third, Basictonalvocabulary is Surgeon’s second album, but he made a name for himself via his early singles. His earliest efforts were highly indebted to Detroit techno, especially Jeff Mills, whose influence is strongly felt on this record. In addition, Surgeon’s trance-inducing sounds hearken back to Kraftwerk and YMO who both had a strong impact on the earliest efforts in the Motor City. Add in a love of trance and electro and you get a big picture of what he attempts here. However, I find it funny that Napalm Death drummer Mick Harris was the one who pushed him to lock himself in a studio and actually make his first record. Basictonalvocabulary is best heard on a pair of headphones or in a club since there is a lot burbling underneath the surface of these tracks. His strength lies in his ability to layer complex rhythms in the foreground and background while laying the bleeps and bloops on pretty thick. Repetition is a powerful thing and Surgeon drives each sequence of beats into the ground while inserting all sorts of ambient whooshes in the background to create a subtly psychedelic effect. It has been twelve years since it was released but much of Basictonalvocabulary wouldn’t sound out of place on a Kompakt or Perlon compilation.